De Ira (On Anger) is a Latin work by Seneca (4 BC–65 AD). The work defines and explains anger within the context of Stoic philosophy, and offers therapeutic advice on how to prevent and control anger. 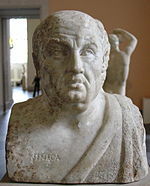 The Stoic philosopher Posidonius (1st-century BCE) is considered the main source for Seneca. Other influences may have included works On Passions by the Stoics Chrysippus and Antipater of Tarsus, and Seneca may have known works written by the Peripatetic philosopher Theophrastus and the Epicurean philosopher Philodemus. The exact date of the writing of the work is unknown, apart from an earliest date (terminum post quem), deduced from repeated references by Seneca to the episodic anger of Caligula, who died 24 January 41 AD. Seneca refers to his brother by his native name, Novatus, rather than his adoptive one, Gallio, which he bore by 52/53 AD, suggesting the work may date from the mid 40s AD. Book III begins with its own introduction on the horrors of anger, and can be read on its own, which has led to suggestions that it was devised either as a later appendix to the work, or that it was a separate treatise in its own right. Ira is defined as anger, wrath, rage, ire, passion, indignation - primarily, to be angry. Although split into three books, De Ira is effectively divided into two parts. The first part (I–II.17) deals with theoretical questions, whereas the second part (II.18–III end) offers therapeutic advice. The first part begins with a preamble on the horrors of anger, followed by definitions of anger. It continues with questions such as whether anger is natural, whether it can be moderate, whether it is involuntary, and whether it can be erased altogether. The second part (Book II.18 onwards) begins with advice on how the avoidance of bad temper can be taught to both children and adults. This is followed by numerous snippets of advice on how anger can be forestalled or extinguished, and many anecdotes are given of examples to be imitated or avoided. The work concludes with a few tips on mollifying other people, followed by Seneca's summing-up. We shouldn't control anger, but destroy it entirely—for what "control" is there for a thing that's fundamentally wicked? De Ira is written within the context of Stoicism, which sought to guide people out of a life enslaved to the vices, to the freedom of a life characterised by virtue. This is achievable by the development of an understanding of how to control the passions (Greek: pathê), anger being classified as a passion, and to make these subject to reason. As a Stoic, Seneca believed the relationship of the passions to reason are that the passions arise in a rational mind as a result of a mis-perceiving or misunderstanding of reality. A passion is a defective belief, they occur when the mind makes errors about the values of things. Seneca states that his therapy has two main aims: one is that we do not become angry (resisting anger), and the other is that we do no wrong when we are angry (restraining anger). Much of the advice is devoted to the first aim of preventing anger. Seneca does offer some practical advice on restraining anger (mostly in III.10-15) although after this he resumes his theme of preventing anger. For the Stoics anger was contrary to human nature, and vengeance considered an evil, which explains Seneca's emphasis on anger prevention. The fact that he offers advice on merely restraining anger shows an awareness that his audience is one of male Roman aristocrats for whom anger was largely a part of everyday routine. The work survives due to being a part of the Codex Ambrosianus (no. 90) manuscript which dates from the 11th century. ^ a b c Monteleone, Maria (2013). "De Ira". In Heil, Andreas; Damschen, Gregor (eds.). Brill's Companion to Seneca: Philosopher and Dramatist. BRILL. pp. 131–2. ISBN 9004217088. ^ a b c Monteleone, Maria (2013). "De Ira". In Heil, Andreas; Damschen, Gregor (eds.). Brill's Companion to Seneca: Philosopher and Dramatist. BRILL. p. 127. ISBN 9004217088. ^ a b C Stark. The Self-Divided Dialogical Self in Seneca's De Ira. (Society for Classical Studies). Retrieved 2015-03-15. ^ a b c Cooper, John M.; Procopé, J. F. (1995). Seneca: Moral and Political Essays. Cambridge University Press. pp. 3–4. ISBN 0521348188. ^ Monteleone, Maria (2013). "De Ira". In Heil, Andreas; Damschen, Gregor (eds.). Brill's Companion to Seneca: Philosopher and Dramatist. BRILL. p. 129. ISBN 9004217088. ^ Brennan, Tad (2003). "Stoic Moral Psychology". In Inwood, Brad (ed.). The Cambridge Companion to the Stoics. Cambridge University Press. p. 276. ^ a b c Kaster, Rober A. (2012). "On Anger". Seneca: Anger, Mercy, Revenge. University of Chicago Press. pp. 9–13. ISBN 0226748421. ^ Colish, Marcia L. (1985). The Stoic Tradition from Antiquity to the Early Middle Ages. 1. BRILL. ISBN 9004072675.